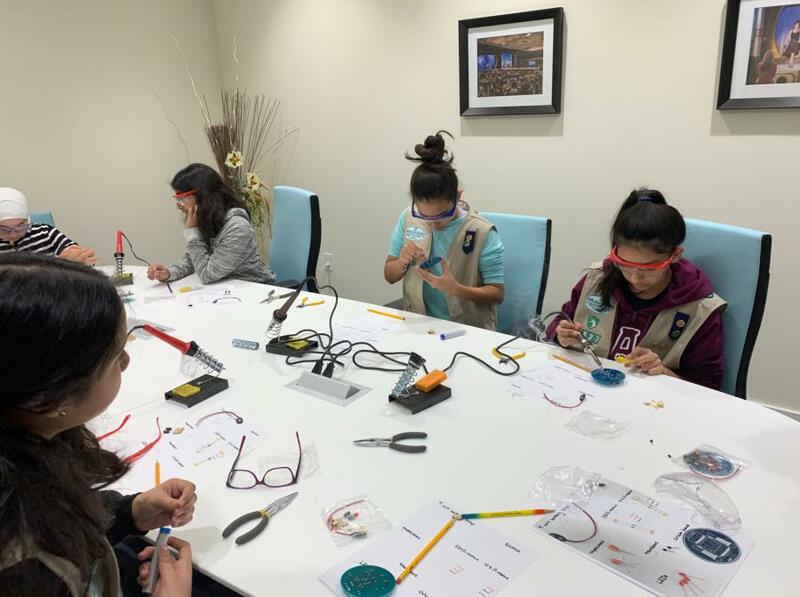 The Girl Scouts Troop 2837 has used the Clearwater Community Volunteers center facilities to host workshops such as the STEM Mechanical Circuitry workshop pictured. CLEARWATER, FLORIDA, US, April 3, 2019 /EINPresswire.com/ -- On April 20th, the Clearwater Community Volunteers (CCV) in downtown Clearwater will host an etiquette workshop during an afternoon tea for Girl Scouts Troop 2837 of West Central Florida. Peggy Patrick, manners educator, will teach the young girls in a private lesson on formal and casual etiquette to help them form and maintain relationships with others, such as their fellow scouts, in alignment with the goals of the Girl Scouts Program. The Girl Scouts program seeks to instill competence in life skills, outdoorsman-ship, STEM and entrepreneurship through a variety of fun activities including the sales of cookies, a hallmark the scouts are well known for. “Our partnership with the Girl Scouts Troop 2837 began with a STEM workshop. Since then we have helped sell their cookies and even asked them to post the colors at our center's anniversary event.” said Michael Soltero, Manager of the CCV Center. Following the lesson by Ms. Patrick, the girls will demonstrate their new found etiquette skills by practicing with each other as they mingle with other troop members. As part of its initiative to bolster the growth of nonprofits, the CCV Center is providing its facilities and a variety of delicate pastries and sandwiches accompanied by an assortment of teas at no cost to the troop. Nonprofit organizations, like the Girl Scouts, are able to use the CCV center’s services to aid in the growth of their group, whether through events such as fundraisers & routine group meetings or working externally on community projects with the center director.